whale reported by a number of locals in west Clare turned out to be a juvenile Cuvier’s beaked whale. The whale measured 3.7m and was a female. Cuvier’s grow up to 5-7m in length with no differences between males and females. A post-mortem carried out today by the IWDG showed it was sexually immature and very thin so probably died of starvation. Cuvier’s are found inhabiting deep-water along Ireland’s western seaboard and are not a coastal species. The whale was very fresh and could even have been live, or certainly, recently died on stranding. Samples were taken for genetics, contaminant and stable isotope and biotoxin analysis. 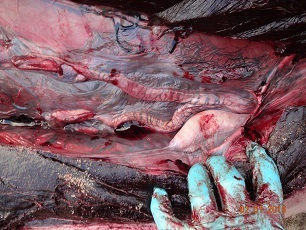 The intestines and stomachs were removed to see if there are any food remains (Cuvier’s typically eat squid) and hopefully to determine whether there are any micro-plastics present (IWDG recently collaborated on a study of microplastics in True’s beaked whales which showed surprisingly high concentrations. Cuvier’s beaked whales have been recorded undertaking the deepest and the longest dives ever documented for any mammal. This study used satellite-linked tags to track Cuvier’s beaked whales off the coast of California and found the animals dove up to 2,992 meters (nearly two miles) below the ocean surface and spent up to two hours and 17 minutes underwater before resurfacing. 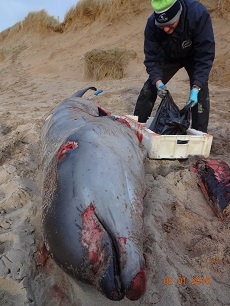 As ever, these strandings give us insights into the ecology of the rarest and least known whale species in Irish waters.